The Lotus Elan was launched in '62. Lotus - based at Hethel, in Norfolk, England - instantly joined the ranks of quality sports car makers. Petite as it was, it packed plenty of muscle. Beneath its lightweight glass-fibre skin, both engine and chassis were rock-solid. Acceleration was searing, handling supple, the ride comfortable. In other words, Lotus hit the jackpot with the Elan! Power came courtesy of a Ford twin-cam in-line four engine. It made 105bhp. Top speed for the Elan was 115mph. It was fitted with a 4-speed 'box - also sourced from Ford. That all sat within a taut and tidy Lotus chassis. Steel backbone by design, it comprised coils and wishbones up front - with Chapman struts and lower wishbones at the rear. Triumph provided the steering rack. Steel wheels were centre-locking. All four were stopped by Girling disc brakes. 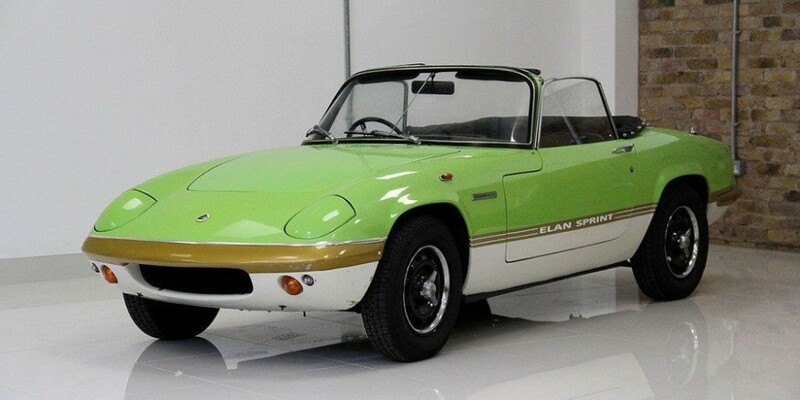 The Elan Sprint appeared in '71. As its name implied, it took performance up a level. Key to that was the Sprint's big-valve cylinder head. It had been expertly engineered by Tony Rudd. Output was up by 25% - to 126bhp. The new motor was more oil-tight, too - and quieter. It came with a set of Weber carburettors. The Sprint marked a turning-point. From then on, Lotus began to move more up-market - and away from its kit-car roots. Throughout the ten or so years of its production run, the Elan had helped Lotus turn into one of the great sports car manufacturers!